(Image courtesy of Daily Kos.) I am nearly speechless with happiness, relief, and joy that our country will be headed back in the right direction after 8 years of darkness. What a marvelous night. I am thrilled that my children have shared with us the celebration of this historic election. Networks are calling it for Obama. He has won Florida, California, and many more. The crowds in Chicago are going wild. I’ve never seen anything like it. 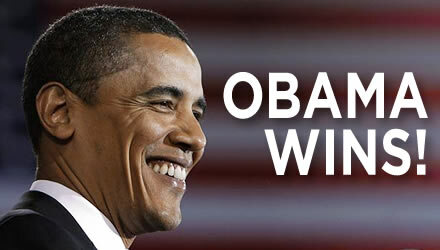 Obama is AHEAD in INDIANA! Just heard that McCain will speak at 11:00. Obama now needs only California to be over 270, so mathematically it is OVER. Why in the world is it taking Lake County so long to count their votes? The margin is so close that they’ll have to wait until everything is in before they call the state. INcredible. There are many strange-looking pundits. Lots of bald guys, and guys with strangely shiny helmet hair, and women wearing inexplicable outfits. Looking awfully secure right now. Winning Virginia, still so close in Indiana. Maybe I’ll get some sleep tonight after all. Hey hey hey, he’s pulled within 7,000 votes in Indiana as Lake and Marion counties come in! NBC has some chick in black with high-heeled boots walking around what appears to be the Enterprise’s holodeck, as graphics and charts spring up around her. Bizarre. Daily Kos is reading my mind. I’ve been fretting about McCain’s current large lead in Virginia, and Daily Kos says “don’t fret about Virginia … everything is cool” because the large urban counties aren’t in yet. Here’s hoping. And I’m loving Obama’s lead in Florida. Anne Northup has conceded to John Yarmuth. I’m really confused by the way the networks keep calling states with 0% reported. Doug says it’s because they have people on the ground reporting in from precincts. But it’s confusing when, for example, the online maps are showing Obama ahead in South Carolina at this point, and yet the state has been called for McCain. It would help me if more explanation was available for why they’re making the calls. My fingers are going to get sore from clicking between Political Dashboard‘s map, which seems to be the more accurately and quickly updated; FiveThirtyEight.com, which isn’t keeping up with things the way I expected; and Daily Kos’s map, which lets you zoom in on individual counties. Indiana is very close, with the big Obama zones not yet in. McCain is currently up in early results in Indiana, Virginia, and Florida. My stomach hurts. If he wins all of them it will be a very long night. I think it’s silly that everyone has called Vermont for Obama when 0% of the state’s votes have been reported. Sure, it’s a certainty, but they could at least wait for the first tallies to come in. Meanwhile, the Indiana lead is bouncing back and forth as results arrive, and it looks like it will be very close. It’s exciting to hear Indiana repeatedly referred to as a key state; a battleground state; and even “the ground zero of this election.” After so many years of knowing my vote for president would mean nothing, this year it finally counts. The ABC guys are writing poll-closing times on kind of a big electronic white board U.S. map, with a funky marker. It looks silly and low-tech. What, they can’t afford a computer graphic that shows all the closing times? Locally, Democratic Congressmen Baron Hill (IN) and John Yarmuth (KY) are showing unexpectedly strong leads against their Republican opponents in the early results. Here’s hoping it’s a sign of things to come. It’s finally here. My stomach is upset. I’ve been unable to focus on anything all day. And now the polls are starting to close, and there’s nothing to do but wait. A bit of good news to begin the evening: at the precinct where Doug was poll watching all day, Obama won 49% to 45.7%. For our little part of southern Indiana, that’s a big deal. Thursday, on NPR’s Talk of the Nation, former Secretary of State Lawrence Eagleburger (who has endorsed John McCain) was asked to make the case for McCain “on the basis of foreign and domestic policy credentials.” He did a great job of selling McCain — until he was asked whether Sarah Palin would be able to step into the role of president during a time of crisis. Eagleburger explained: “I don’t think at the moment she is prepared to take over the reigns of the presidency. I can name for you any number of other vice presidents who were not particularly up to it either. So the question, I think, is can she learn and would she be tough enough under the circumstances if she were asked to become president, heaven forbid that that ever takes place? Saw this courtesy of my friend Jack. As the video says, “It hasn’t happened yet…” Let’s make sure it doesn’t. If your state will let you vote early, do it today. And if you have an hour (or 5, or 10) to spare, head to your local campaign office and make some calls or knock on some doors. Help make sure that next Tuesday, the result is one America won’t regret. “Talk to your parents about John McCain,” says one narrator.For my sake? Please? vote early and beat the crowd! At the Obama rally we attended on Wednesday, we heard one message repeatedly from volunteers by the line to get in and from the volunteer organizer who was the first speaker: Vote early. I don’t know how the laws work in the rest of the states, but in Indiana we can go to any of several locations in our county and cast an early ballot. This isn’t the same as voting absentee: the ballots are collected, sorted by precinct, and counted later along with all the rest cast on Nov. 4. Encouraging people to vote early ensures that those supporters’ votes are cast regardless of what happens on Election Day. You don’t have to worry about a long line, or the precinct running out of ballots, or having to work, or finding childcare, or being sick, or forgetting to take your ID with you, or it being too wet/cold/snowy outside. You can go vote any day that you have a few free minutes; and if you do forget your ID, or some other mix-up occurs, you can try again the next day. I love the idea. I may do it, although I get a huge shot of satisfaction from actually entering a voting booth on Election Day and marking the boxes on my (paper!) ballot. But I’m frankly nervous about our local government’s ability to safely store the early ballots and then reliably produce them when the time comes. I’ll probably go to the County Clerk’s office and ask some questions about procedures, and then decide. If you live somewhere that allows early voting, why not go ahead and vote today? 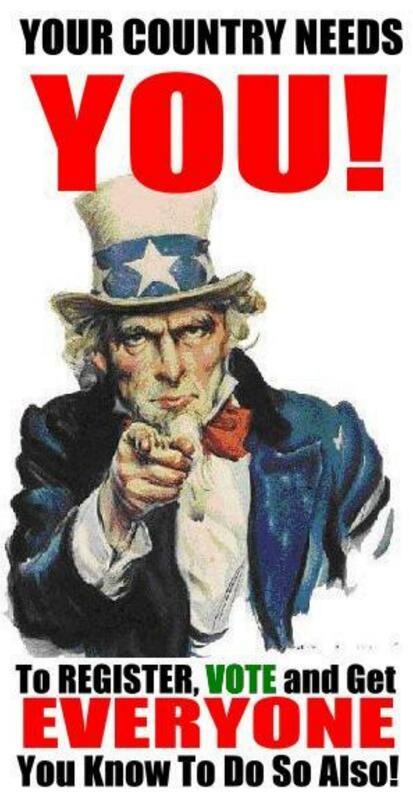 You’ll have the satisfaction of knowing you’ve done your civic duty and helped forge the future of our country. Then, when Nov. 4 rolls around, if you just can’t bear to stay away from the polls, you can give rides to elderly friends or others who need some assistance. We were very, very glad we took the kids along to see this potentially historic event. Our trip to see Barack Obama speak in Indianapolis yesterday was worth every minute of the drive, the wait in the incredibly long line, and the additional wait in the damp, cool outdoor grandstand where we sat. The man is a tremendous presence, and he spoke of working together, of making our country and the world a better place, of making sure that average people can lead good lives. He was phenomenal. 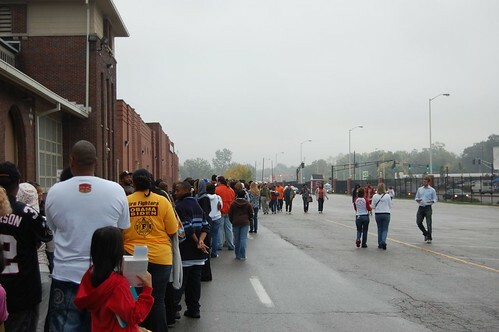 We arrived an hour before the gates opened, and the line was already at least a quarter mile long, wrapping around the buildings of the Indiana State Fairgrounds, with more people arriving constantly from all directions. It was the most diverse crowd I’ve ever been part of — black and white; older people, 20-somethings, and elementary school groups; union groups wearing matching shirts; people in all varieties of Obama-wear. While we waited, volunteers went up and down the line asking people to consider volunteering to help the campaign for a few hours between now and Nov. 4. Other folks demonstrated the spirit of free enterprise by selling buttons, hats, and t-shirts. Once the gates opened, the line moved fairly quickly. At the base of the Security personnel checked all bags and belongings, and everyone walked through a metal detector. Volunteers were everywhere, directing people to seating. One of them pointed out the way to the infield, where we could be near the stage. It sounded good, so we gave it a try; and yes, we were probably only about 50 feet from the podium, but we were also standing in about 4 inches of mud — and would be for at least 3 hours, packed into the crowd. 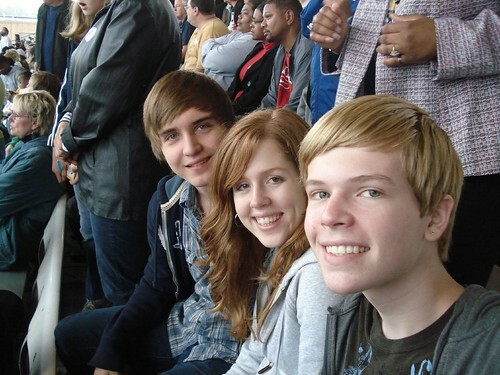 Sitting in the grandstand began to look like a good idea, so we moved up into the seats. Because we were there so early, we got excellent seats near the center and not too far up, close enough to see the speakers’ faces. Overflow people were directed to the infield. By 11:45, when the first speaker came to the podium, the grandstand was full (it holds about 14,000) and latecomers were being directed to the infield. We heard from a volunteer organizer, from the Indianapolis congressman, and from Jill Long Thompson, who’s running for governor. Then there was a short break, followed by an amazing new song; I didn’t know what it was at the time, but told Doug that it sounded like Lionel Ritchie. Turns out I was right: It’s a song called “Eternity,” with Ritchie’s singing mixed with Obama’s words. You can hear a sample here. (It gives me chills.) At the same moment, Obama’s motorcade entered the fairgounds area, and the crowd erupted. 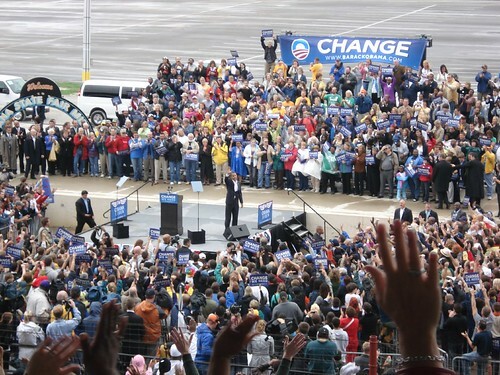 Obama walked onto the stage to Bruce Springsteen’s “The Rising.” He began by commenting, “What a magnificent crowd!” I agree, particularly because it was the middle of the day on a rainy, cool weekday in Indiana. He spoke for about 45 minutes, covering all his major campaign themes but also touching on some new points and covering economic issues in more depth. (Speaking about those who will get a tax cut: “Let’s see a show of hands: How many of you are making less than a quarter million dollars a year? [Pretty much every hand goes up] Yeah, that looks like a majority!”) Several times, he got really fired up in a way I haven’t seen at the Democratic Convention or in the debates, and it was marvelous to hear the emotion and commitment in his voice. As he finished, the music came up: Stevie Wonder singing “Signed, Sealed, Delivered.” Perfect. As we made our way out, my son commented, “That was amazing.” We left feeling energized, excited, hopeful, and most of all positive. Obama made no personal attacks; he talked about the need to make changes that will transform our country and help all Americans. It was a message of cohesion, of national pride and strength, of the hopes that we all share, and of his readiness to lead the country forward. It was a great day, and we heard a great message from a great man. 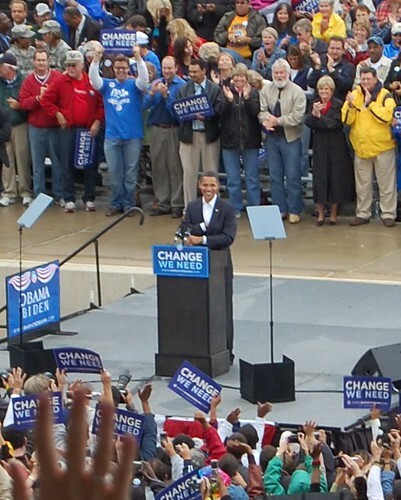 On Wednesday, we’re going to hear Barack Obama speak at the Change We Need rally in Indianapolis. Yes, that’s right: the capital of Indiana, a traditionally Red state that this year is wavering toward going Blue. A wavering so distinct that the Democratic candidate is coming here less than a month before the election. Who would ever have thought it possible? We’re taking our daughter (a high-school senior) out of school to come with us; her boyfriend’s family has also agreed that he can go. What better civics/government lesson could they receive than watching our great American democratic system in action? I Am Excited to see and hear Obama in person.